Hip replacement surgery involves removing an arthritic hip joint and replacing it with an artificial one, known as a prosthesis. The prostheses consists of a ball component, made of ceramic or metal, and a socket, which is composed of a liner or insert that is made of ceramic, metal or plastic. The implants used for hip replacements are biocompatible, which means they are designed for your body to accept them. They are made to resist against degradation, corrosion and wear. Replacements are often used for those who have joint damage from an injury (for example a fracture) or arthritis. After the hip is replaced, rehabilitation comes into play to relieve pain and restore movement and function in the joint. If the hip has been damaged by a fracture, arthritis or other conditions, common activities can become difficult and painful. The hip can become stiff and it might be hard to put socks and shoes on. You might also feel uncomfortable when sitting back and resting. The hip is made up of the acetabulum (the socket) and the femoral head (the ball). The acetabulum is part of the pelvis, and the femoral head is part of the femur (your thigh bone). The joint is a ball and socket to allow lots of different ranges of movement, which is great for walking and running. The joint has a deep socket so it’s very secure, but years of walking running and pressure on the joint can cause degenerative change to the cartilage that protects the joint. Once the cartilage is worn, you get a situation of bone-on-bone and this is the time when a total hip replacement is required. In severe cases of hip arthritis, you can get a condition called avascular necrosis which literally means “cell death due to lack of blood” and it causes the femoral head to disintegrate. 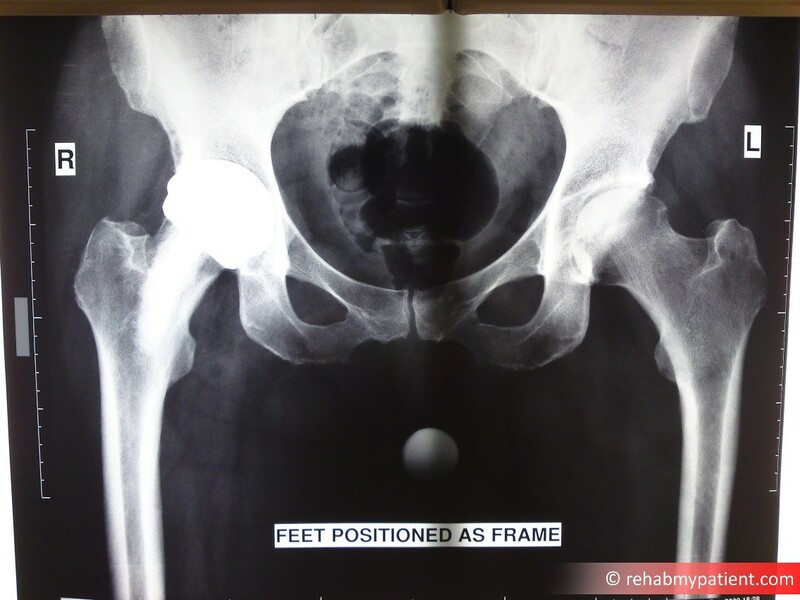 There are two main issues following hip replacement. The first being secondary stiffness, where the joint gets stuck due to adhesions and scar tissue, and also inflammation around the joint. This limits movement and typically a patient will have difficultly lifting their knee up, or putting on socks. Secondly, a leg length difference. In the surgical procedure, the operated bone is cut and the prosthesis is put in. If the measurements are not accurate, the leg can be left long or short. This can cause a limp and slow rehabilitation time. 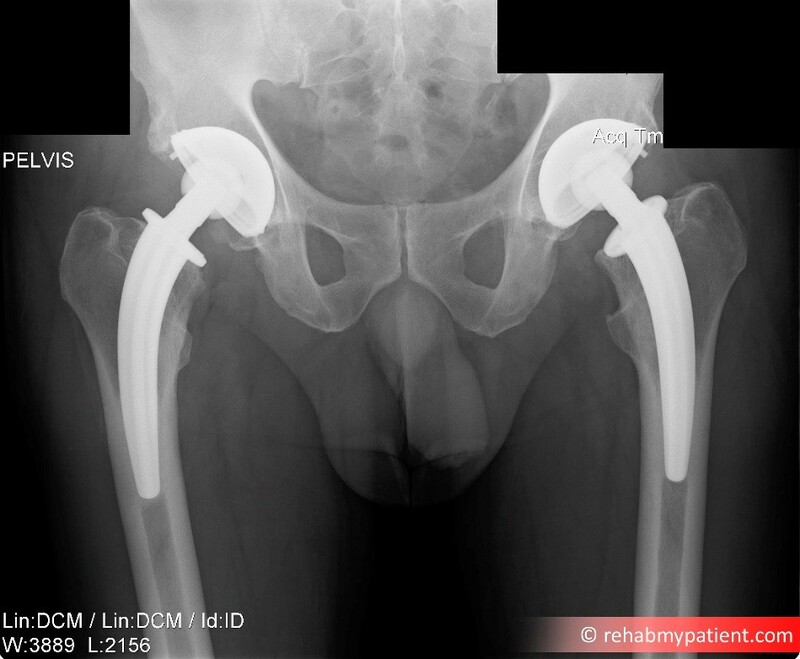 An X-Ray showing a total hip replacement on the right side. There is also moderate osteoarthritis on the left hip. To help minimize the amount of pain, both before and after surgery, you can take a pain medication to help make it through the recovery and surgery. Partaking in a physical therapy program can help with strengthening and stretching the hip region to help prevent further injuries. Start the therapy at 1 week post-op and continue it for around 12 weeks. Working alongside a trained professional, you will learn the proper exercises to help improve strength, flexibility and coordination. Make sure to follow the recommendations of your health care provider to ensure you don’t do additional harm. Swimming, gentle walking, and gentle cycling can all be beneficial as part of a strengthening program and your therapist will advise you further. · Initially don’t be surprised if the joint is very painful and stiff. Many people think that hip replacements are routine but far from it, it’s a big surgery so expect to be in pain afterwards. · After a few months, you can expect the new hip joint to reduce all of the pain you felt before surgery and increase movement in the joint. · Don’t expect to be able to do any of the activities that you couldn’t do before the surgery took place, such as playing basketball or running. · With enough time, you might be able to play golf, swim, ride a bike and walk comfortably. · Hip replacement surgery has been proven successful in 90 percent of the cases. · To prepare for surgery, you might need to begin an exercise program.